Citruss TV brings you the Italian cookware brand Balzano. The made-of-Aluminum pan has a double-sided non-stick coating with a silicone lining that keeps the steam inside. It transfers heat fast and it is time- and energy-saving with detachable sides making it easier to clean. Blazano is a light weight, anti-scratch, 3-in-1 pan; it can be used for double, deep frying, and regular frying. It comes with a glass cover, handle for glass cover, silicone strip and steam plate. 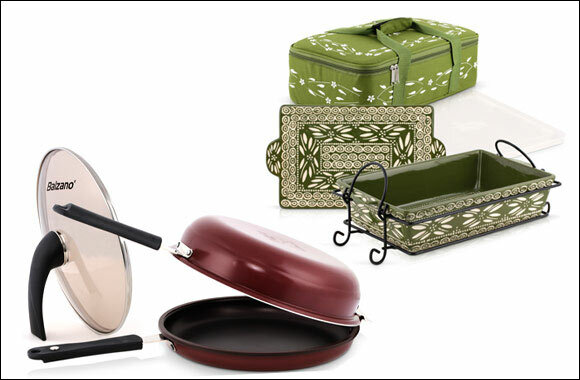 Citruss TV brings you Manal Al Alem temptations ovenware Pack & Go. The safe and easy to carry around is made from high quality ceramic, which can be used in the oven, microwave, fridge and freezer. The set is naturally non-stick it comes with a stoneware lid that can be used for baking, serving and trivet, or you can use the plastic lid that allows you to store and stack the ovenware when done baking. It also comes with a wrought iron basket with handles to serve and pass around easily. The Pack & Go set has a matching thermal bag that you can put the ovenware in. 1 year limited manufacture warranty. Available in blue, green and red.